Land along the Chao Phraya River is becoming a magnet for real estate development, with companies keen to remodel areas on both sides of the river. Much of this interest comes in the wake of last year's opening of Iconsiam, a high-end mixed-use project which garnered a huge amount of publicity. It now seems likely that many more new projects will follow suit, with the most high-profile being the proposed "Chao Phraya Gateway". It is the brainchild of the State Railway of Thailand (SRT), which hopes to capitalise on a 277 rai plot on the riverside area in Klong Toey district. Currently, the plot remains undeveloped. There is the old Mae Nam railway station on Chua Phloeng Road near Rama III Road, a rarely used railway line and a vast area occupied by land encroachers and warehouses. The SRT has a grand vision to use this derelict area to house a new mixed-used project on a par with Iconsiam. It believes the plot could be the location for a regional shopping hub, ultra-luxury hotels, condominiums, a posh shopping mall as well as modern office spaces. The SRT has already conducted feasibility studies and considered investment options. Bidding for the Chao Phraya Gateway is set to run over the next two years. The value of the project is estimated to be around 200 billion baht. "The Chao Phraya Gateway will not be just another mixed-use complex in the capital, it will also serve as a gateway to the whole river area," deputy SRT traffic manager Somyut Rueanngam told the Bangkok Post. The SRT believes its plans have a unique selling point. While the giant Icoansiam shopping and residential complex in Khlong San offers visitors a city view of high-rise buildings in Silom and Sathon, the SRT boasts that Bang Krachao island will form the vista for this project. Bang Krachao is a vast green island in Samut Prakan province, described as Time magazine as the "Best Oasis of Asia". The SRT believes visitors and residents will enjoy the scenic view and access to better air and a greener environment. In terms of investment, the SRT's plot is also four times larger than Iconsiam, and along a longer 1.16-kilometre stretch of the river. 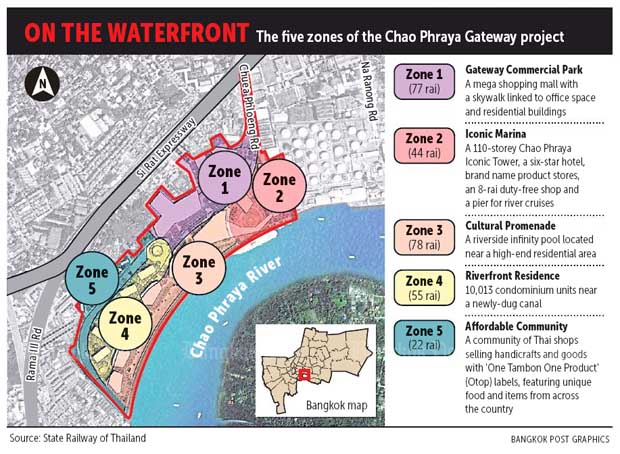 The Chao Phraya Gateway's greater size will give developers more freedom, the SRT believes. According to plan, the project will have one six-star hotel with 656 rooms, a four or five-star hotel and one large shopping mall. Condominiums will be erected in almost all of its five zones, according to Mr Somyut. The Chao Phraya Gateway will also house a new convention and exhibition centre, making it a rival to the Queen Sirikit Convention Centre located nearby. 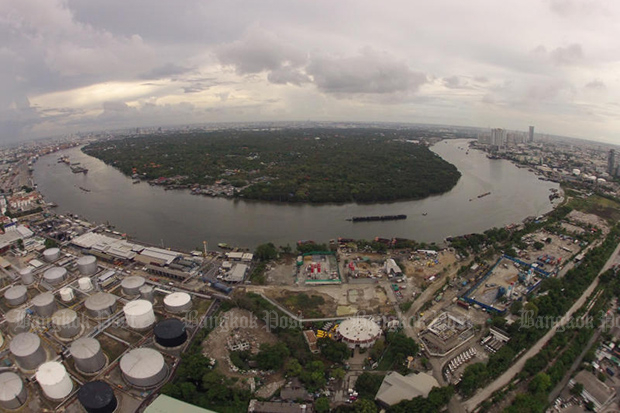 There will also be a "Chao Phraya Iconic Tower" which will be 350 metres tall. The tower will house a Sky Restaurant where diners and visitors can enjoy food and a panoramic view of Bangkok. The SRT plans to make it the tallest skyscraper in the capital. A monorail network will also be built to facilitate travel to the area, according to the SRT. The Chao Phraya Gateway is the among land development projects that the SRT hopes will enable it to clear its massive 100-billion-baht debts, acting SRT governor Worawut Mala told the Bangkok Post. 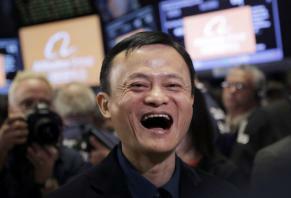 His agency plans to woo investors to join the project under a private-public partnership. Though they have to bear all risks, the investors will be granted the right to earn revenue during a 30-year concession and will pay dividends to the SRT. The project is expected to break even in less than eight years and its profitability is projected at 140 billion baht. "One condition is they have to give us a share of 9.3 billion baht from their revenue throughout the concession period," said an SRT source with knowledge of the project. The SRT is in the process of forwarding its plans to the Transport Ministry for approval. However, Pornarit Chounchaisit, president of the Thai Real Estate Association, says it is too soon to assume that any project on the river will be profitable. "The project may not greatly attract investors as retailing and office-for-rent businesses have reached saturation point." Iconsiam was born late last year and soon will face new rivals, including Bangkok One on Rama IV Road and Bangkok Mall near the Bang Na intersection. 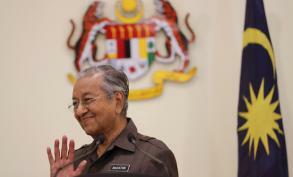 "There are many other new projects," Mr Pornarit said. "This clearly shows the city is going to encounter oversupply." The SRT also has another problem to solve. It is struggling to deal with people and businesses who have encroached on the Mae Nam railway station compound. The area used to house large machinery, trucks and has become a campsite for construction workers. 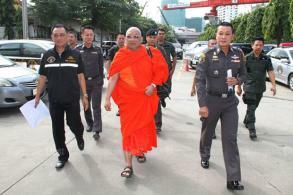 Mr Somyot admitted some SRT officials allegedly took bribes to facilitate these illegal uses. According to a Transport Ministry source, a panel has found two officials involved in the wrongdoing -- one a building maintenance chief and the other a railway station official. The panel believes other officials are also at fault. The SRT is gathering evidence to file charges with police against the encroachers, who are currently the only main obstacle to the project getting off the ground.